The naturally-aspirated 4.5 litre straight-six Lago Talbots were regular winners in Post War European racing against the supercharged 1.5 litre Alfa Romeos and Ferraris of the day due largely to their comparatively good fuel consumption and reliability. Three-time Australian Grand Prix winner Doug Whiteford added a new level of professionalism to local motor racing when he purchased the ex-Louis Chiron Lago Talbot T26C and drove it to victory in the Australian Grands Prix at Bathurst in 1952 and at Albert Park in 1953. 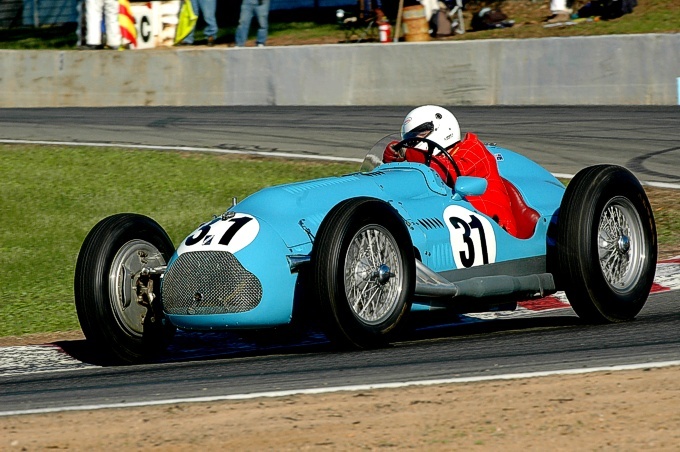 After selling the Lago, he went on to purchase a later-specification, more powerful T26C in 1954, winning the Argus Trophy race at Albert Park on its first outing in 1955 and placing third in the Australian Grand Prix behind Jack Brabham’s Cooper Bristol and Reg Hunt’s Maserati 250F the same year. In 1956 he drove the car to a very creditable eighth in the ‘Olympic’ Australian Grand Prix at Albert Park behind a string of new Maserati 250Fs including the ‘works’ cars of Stirling Moss and Jean Behra. Had he not been forced to stop twice for water for the overheating Lago, his lap times confirmed he would have been right up with the factory Maseratis. Purchased in damaged condition by Reg Hunt and then fully restored to mint condition in the early 1980s, Whiteford’s second T26C (Chassis No 110002) is now in the hands of its new owner, Ron Townley. is this the 1st car.? Yes at the AGP in 1956,driver Owen Bailey and yes a teenage Ian Tate.